by Rebecca Wilson Author · Anne Lamott Author of introduction, etc. In 1966, Rebecca Wilson's father, a Union Leader and civil rights activist, was assassinated on the street in San Francisco. Rebecca—known throughout as "Becky"—was three years old. 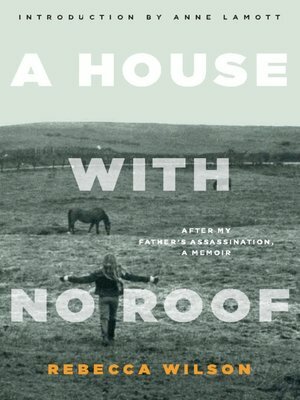 A House with No Roof is Wilson's gripping memoir of how the murder of her father propelled her family into a life-long search for solace and understanding. Following her father's death, Becky's mother, Barbara, desperate for closure and peace, uproots the family and moves to Bolinas, California. In this small, coastal town of hippies, artists, and "burnouts," the family continues to unravel. To cope, Barbara turns to art and hangs a banner that loudly declares, "Wilsons are Bold." But she still succumbs to her grief, neglecting her children in her wake. Becky's brother turns to drugs while her beautiful sister chooses a life on the road and becomes pregnant. As Becky fumbles and hurtles toward adulthood herself, she comes to learn the full truth of her father's death—a truth that threatens to steal her sanity and break her spirit. Told with humor and candor—and with love and family devotion at its heart—A House with No Roof is a brave account of one daughter's struggle to survive.